In March 2017, Michal Kosinski, a psychologist and director of the Psychometrics Centre at Cambridge (currently professor at Stanford), presented the results of some of his studies at CeBIT's Keynote: Psychometrics applied in the context of the Social Media. More precisely, one of the Psychometrics most applied methods: the Big Five (five personality traits: openness, conscientiousness, extroversion, amicity and emotional stability - neuroticism in the original term), through which create large profiling clusters. If it reminds my research ambit, the digital clusters you're right: but they are two different things (even if contiguous). Psychometry is used since Nineties to determine the personality traits with a metric model, as the name: through interviews, surveys, etc. Prof. Kosinski, instead, used social data, such as Facebook in particular, to get accurate results in less time. 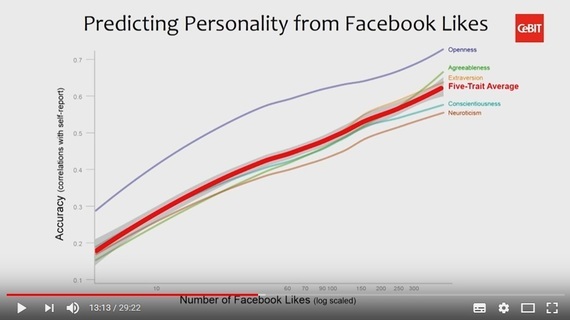 In the video, he shows a chart analyzing the likes of an experimentation, identifying the traits of "personality" with precision: with a few hundred likes, in particular, the accuracy he affirms is more than 80%. The video is called "The End of Privacy" and is online. There is also a site you can try yourself, if you want: log in with Facebook at applymagicsauce.com. What I wanted to emphasize is another important aspect of this story: the "automatic" behavior behind our activities on social networks - and not only. Michal Kosinski, if you had the patience to see the video, shows that with a certain number of likes he is able to delineate personality traits. Is that true? We can answer "yes" in a first general answer. But, what does he mean with "outlining people personality" and what he "observes"? Psychometrics is an objective-descriptive description: it observes and catalogs. Before Internet these method involved personal surveys and interviews, that is, a psychologist or psychiatrist controlled the experiential context and the person doing the tests. What happens with social media? This is a bit different. We have to deal with at least three things: i) The disinhibition phenomena given by the medium, ii) the de-contextualization effect, and iii) the "Automatic behaviors", that's the more interesting part. The disinhibition - that is, the fact of viewing a screen and not a real person - is a known base factor: it disables the nuances of non-verbalized communication, and they are many. The automatic behaviors triggered in this context (the social behaviors) make the observation prone to virtually infinite misunderstandings - rather I would say this is the most common thing! Just look at the comments, the flames, the endless discussions, etcetera. Way more interesting is the experiential de-contextualization. I try to explain it in a nutshell: reading a thing or writing it on social media is very far from having an experience of that thing. The ways in which we're involved in the social media world make the narration still more distant from the reality, and they place the shared experience in a "virtual non-place" -which is transmitted and recorded. In times of profound changes in the context of communication and interaction, (narration and storytelling are continuosly in our lives), the social media influence in a much more subtle way. Facebook is consulted by billions of people every day (tens of millions in Italy), mostly in mobility. Psychometry is thus an observation from the outside of things that we routinely do and say or what others do or say. In the case of social media, others write. But be warned, because our knowledge of the other is influenced by our needs and expectations.The question is: these data read and seen how much correspond to what the person is, to his motivations? Well, not much. A true awareness requires the unveiling of one's inner mechanisms of self-deception, self-knowledge, personal narration and, finally, Self.. Furthermore, the relationship between external behavior and thoughts is revealed through action. But even action, which is considered thought, reflected (the notorius and inaccurate saying "thought is forerunner of action"), fruit of free will, in many cases is automatic - through Heuristics, when all goes well, or Cognitive Biases when there is a distortion... People, often, don't really know the reasons for which they do something. Sometimes, when they're questioned on the motivations of their behavior, they provide not congruous explanations. Any psychologist or psychotherapist will confirm this experience. It's the narrative construct, in which the person "tells self a story". That our behavior is a direct and conscious expression of our will in reality, is already a questionable fact; let alone on social networks! Let's go back to the algorithms. They know what is the motive that triggers and causes an automatic behavior? Tendentially yes, but with some important distinctions. Firstly, propaganda: the call to an ideal, a value, a need or a fear, are well known baits by behavioral marketing and widely used by communication pros. So, we can see where is the matter: if these clicks, these likes, are the result of automatic behavior, then they are not particularly aware and, finally, not so meaningful. In other words, the person who clicks, puts a like, etc. on the basis of solicitations, acts in a context with poor control nor full awareness. Therefore, in this context the algorithms that observe these reactions and behaviors, in some way measure the degree of unawareness that these behaviors have. Is this a problem? Probably not, but in the sense that these dynamics don't depend on Social media. The unawareness is there regardless of the medium. It's explicit on Facebook because this social is the most used widespread, and with more trust (...) and involvement. The fact that "Facebook conditions us" is meaningless enough: the algorithms amplify, select and present us with a "reality" that we largely already see, or rather, we want to see. So much we want to see reality some way, that if we don't find algorithms presenting that way, we start looking it by ourselves (leaving precise traces, however, that deeply help algorthms in the selection). The difference between us and them is that algorithms are good and precise, and they stimulate the automatic behaviors to trace their magnitude and present the desired contents to an ever larger number of people (and advertisers...). The problem then is not the fact that what is written on social media is read or scanned by others, and then used by marketing or politics. This was already known for a long time. The sale of data is the business of platforms, and psychometry analysis on social media is the last piece of a well known model.. The problem is to know the real "accuracy" that these data contain, be aware of what you write and, above all, what you want to read. This page contains a single entry by Luciano published on March 28, 2018 12:00 AM. Connecting the dots ~ Balance of a year was the previous entry in this blog. Rick Genest, known as Zombie Boy, dead of suicide at 32 is the next entry in this blog.